Location: 24.9 North Latitude, 58.9 West Longitude or about 625 miles to the southeast of Bermuda. Minimum Central Pressure: 969 Millibars or 28.62 Inches. Forward Movement: West-Northwest at a forward speed of 9 mph. Florence is rapidly strengthening this morning and will reach major Category 3 hurricane strength by this afternoon and then Category 4 intensity by tonight or Tuesday morning. Satellite imagery indicates that Florence has cleared out a small eye, which is apparent on satellite imagery. The outflow associated with the hurricane is expanding on the northern and northwestern sides of the storm. In addition, very strong convection is now firing in the eyewall of Florence. Because of all this, Florence is now a Category 2 hurricane and is well on its way to Category 3 and likely Category 4 strength. Florence is now moving on a west-northwest course and a high pressure ridge building to the north and northwest of the hurricane will steer it on a west-northwest to northwest track over the next 2 to 3 days. Beyond this, another ridge of high pressure over the Ohio Valley will cause Florence to slow way down in forward speed on Thursday as it approaches the Carolina coastline. I wish the news were better this morning when taking a look at the latest forecast guidance, but it is grim. The model guidance spread, overall for a 3-4 day forecast, is pretty small with a range from about Georgetown, South Carolina to the outer banks of North Carolina. The latest European model guidance and its ensemble members have shifted back to the southwest and shows a landfall somewhere on the South Carolina coast between Charleston and Myrtle Beach. On the other hand, the UKMET model has shifted to the northeast and now shows a landfall near Morehead City, North Carolina on Thursday night and Friday morning. The intensity guidance with Florence now shows a majority of its members forecasting Category 4 strength with one member forecasting Category 5 strength from Tuesday afternoon to about midday Thursday. Changes in the model guidance track forecast are likely to continue for the next day or two. The bottom line is, however, that a major hurricane is likely to make landfall somewhere along the North Carolina or South Carolina coast (Area from Myrtle Beach to Morehead City is at highest risk right now) on Thursday evening. Anyone along the South and North Carolina coastline, especially across northeastern South Carolina & southeastern & eastern North Carolina needs to prepare NOW for a major hurricane impact. Here Are My Thoughts: It still looks like the area from about Myrtle Beach, South Carolina to Morehead City, North Carolina has the highest risk of a direct strike from a major Category 3 to Category 4 hurricane with 120 to 140 mph winds on Thursday afternoon and Thursday evening. With that said, the smallest changes in the forecast track will have large consequences for the South and North Carolina coast. If Florence makes a direct landfall into the region from Myrtle Beach to Wilmington and pushes straight inland, it will lead to a major storm surge and significant to major wind and storm surge damage across not only northeast South Carolina and southeastern North Carolina, but also across the barrier islands and sounds across eastern North Carolina. On the other hand, a more south to north track across the outer banks of North Carolina or far eastern North Carolina, while still severe, would spare southeastern North Carolina and much of South Carolina a major hit, but severely impact the outer banks of North Carolina and the sounds of eastern North Carolina. In addition, even though a landfall somewhere between Myrtle Beach and Morehead City looks very likely, a slightly further south or a slightly further north track is still well within the realm of possibilities. This means areas as far south as Charleston, South Carolina or as far north as southeastern Virginia need to very closely monitor the progress of Florence. Impacts in terms of increasing winds, tides and rainfall will begin along the US Southeast Coast late Wednesday night and Thursday morning. Weather conditions will likely deteriorate with hurricane force winds developing by midday Thursday with the worst of the hurricane expected Thursday afternoon and Thursday night. 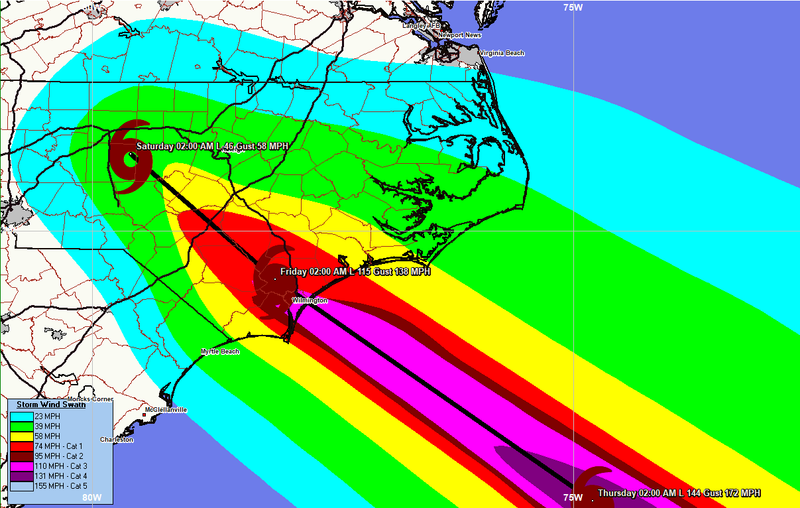 If you live along the South Carolina & North Carolina Coast: NOW IS THE TIME TO PREPARE! Destructive winds and a destructive storm surge are expected with Florence. Go over your hurricane preparedness kit NOW! Know your evacuation routes, make sure you have enough supplies to last you at least one to even two weeks. All hurricane preparations need to be completed by or before Wednesday. If Florence is a Category 3 or 4 hurricane at landfall, it will produce a very large storm surge of at least 10 to 15 feet above ground level across parts of northeastern South Carolina and southeastern and eastern North Carolina. This means that if you are in a storm surge zone and you are told to evacuate – THEN EVACUATE! 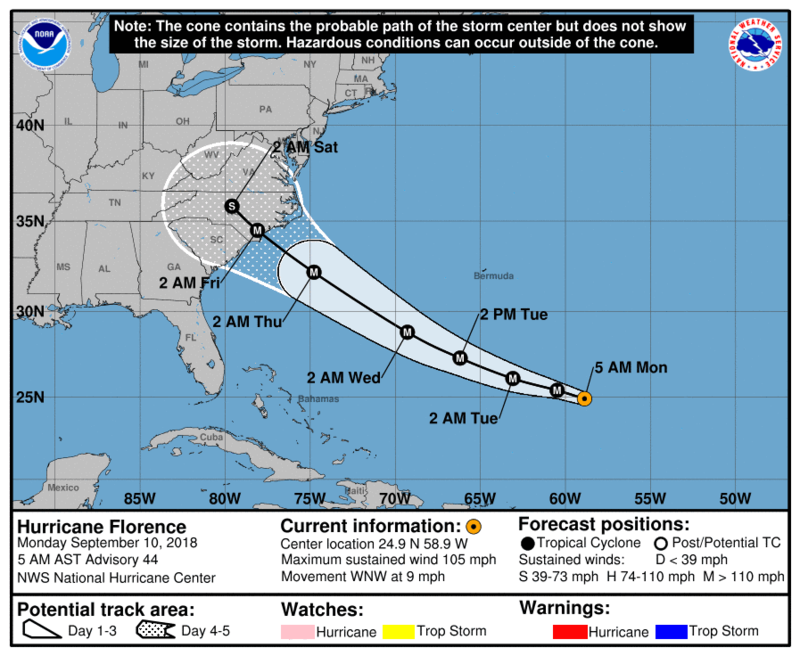 For areas further inland across central and eastern North Carolina through a large part of Virginia, southern Pennsylvania, parts of Maryland and Delaware – It looks very likely that Florence will stall out somewhere over eastern North Carolina or northeastern South Carolina and dump obscene amounts of rain. At least 1 to 2 feet of rainfall is expected across this region from Thursday to about Sunday with local amounts of 30 inches or more possible. Catastrophic flooding is expected across this area late this week through next weekend. Strong winds of tropical storm force with wind gusts of up to hurricane force are expected across a large area of eastern and central North Carolina into southern Virginia Thursday afternoon, Thursday night into Friday morning. These strong winds will not only down trees and power lines along coastal locations, but also across inland parts of eastern and central North Carolina and southern Virginia. Plan now for a long duration power outage across a large area. Location: 14.7 North Latitude, 42.7 West Longitude or about 1230 miles to the east of the Windward Islands. Minimum Central Pressure: 993 Millibars or 29.33 Inches. Forward Movement: West at a forward speed of 13 mph. Isaac continues to be a tough storm to forecast, especially in terms of intensity forecasting. Satellite imagery this morning indicates that Isaac is a small hurricane. Small hurricanes have a notoriously bad habit of intensifying really quickly and then weakening just as quickly. Right now, however, Isaac is holding at a 75 mph hurricane. 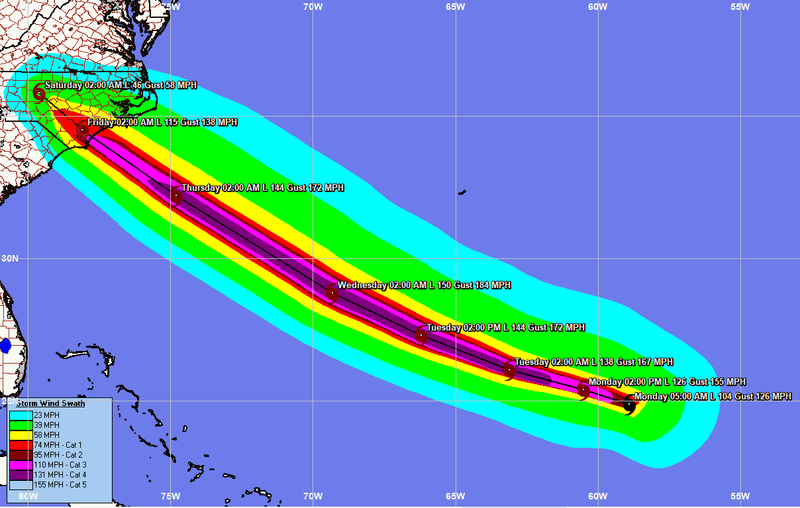 Isaac is moving on a westward track and the guidance are horribly bad on their forecast tracks with the storm. Some of the guidance such as the UKMET model forecasts Isaac to turn northward just to the east of the Lesser Antilles as a trough of low pressure pulls it to the north. On the other hand, the GFS and European model guidance have been quite consistent in forecasting a due west track across the central Lesser Antilles and into the Caribbean as Isaac is guided by a strengthening ridge of high pressure to the north. At this point, my thinking is that the nearly due west track seems more plausible right now. The intensity forecast for Isaac, I think, is extremely difficult. As I already mentioned, small hurricanes like this one are very prone to quick changes in both strengthening and weakening. In addition, the intensity guidance is in poor agreement as solutions range from steady weakening from this point on to a majority of the guidance forecasting Isaac to remain a Category 1 hurricane to the HWRF model forecasting rapid strengthening into a Category 3 to 4 hurricane just as Isaac moves across the Lesser Antilles into the eastern Caribbean. My thinking is that Isaac will remain in the Category 1 hurricane range as wind shear values will remain at 10 knots or less from today through Tuesday. After Tuesday, the wind shear is expected to increase to 25-35 knots which should lead to Isaac weakening as it moves through the central Lesser Antilles and into the eastern Caribbean. One change in the forecast is that Isaac may not dissipate in the Caribbean as shear values may decrease again by this weekend as the storm approaches the central Caribbean. This means that the western Caribbean may really need to keep a close eye on the progress of Isaac for this weekend into next week as it could be a threat to you. 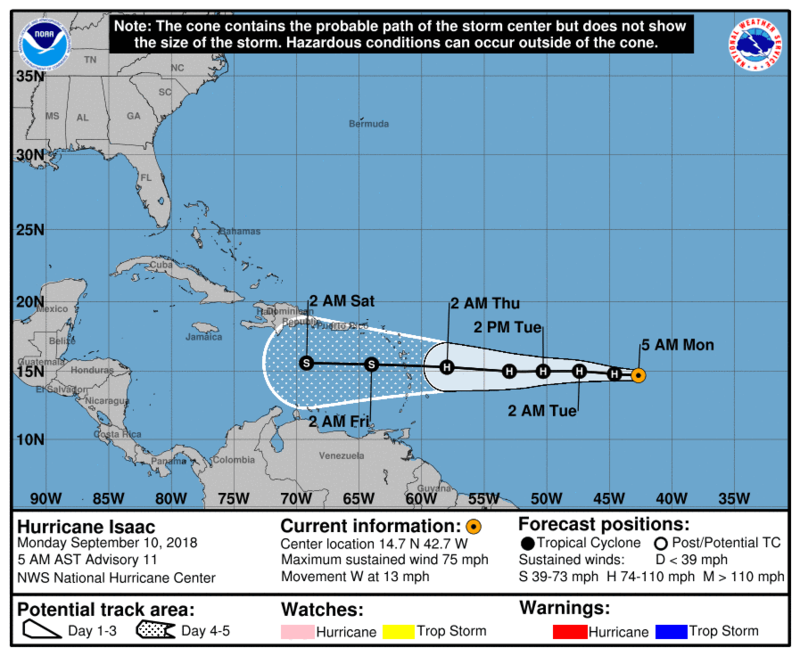 My Thinking Is That Isaac will end up tracking right across the southern Leeward Islands and northern Windward Islands on Thursday afternoon and Thursday evening as somewhere between a 80 and 100 mph hurricane. 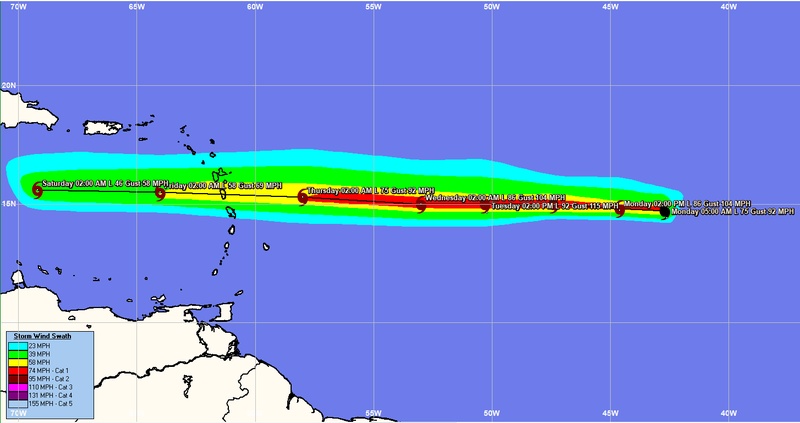 The islands that really need to keep an eye on this storm include Antigua, Guadeloupe, Dominica and Martinique. I do want to stress that, while it is an outlier right now, the HWRF model's forecast of a rapidly strengthening hurricane moving across Antigua, Guadeloupe and Dominica is extremely concerning and it is something to really watch for. Bottom line is that I strongly urge everyone across the islands of Antigua, Guadeloupe, Dominica and Martinique to closely monitor the progress of Isaac and that you should probably start preparing for hurricane conditions on Thursday, just in case. Islands as far north as St. Martin and Anguilla and as far south as St. Lucia should also closely monitor the progress of Isaac and know that tropical storm conditions could impact you on Thursday. Finally, those of you in Jamaica, the Cayman Islands, Belize and the Yucatan Peninsula might want to keep an eye on Isaac, just in case it starts strengthening again this weekend. The soonest Isaac might start affecting you is around next Monday and next Tuesday. Western Gulf Of Mexico Tropical Development A Possibility Later This Week: If Florence and Isaac weren't enough, I continue to keep a very close eye on an area of disturbed weather over the northwestern Caribbean. This disturbance is expected to move slowly northwestward reaching the western Gulf of Mexico by Wednesday night and Thursday. The environmental conditions are expected to become more favorable for development by then and we could see the formation of a tropical depression or a tropical storm during Thursday into Friday over the western Gulf of Mexico. The European model guidance continues to trend stronger with the development of this disturbance. Right now, the European model is alone in this forecast with the GFS model showing nothing. In addition, the European ensemble guidance is forecasting a 70 percent chance for tropical development in the western Gulf of Mexico with a track that takes it inland into the lower and middle Texas coast as a tropical depression late Friday into Saturday. I will be monitoring this disturbance closely and will have additional updates for you in the coming days. The next tropical weather discussion will be issued on Tuesday Morning or sooner if conditions warrant.